Interest only home mortgage loan using private mortgage lenders a consumer proposal strategy and bad credit home loans, turns around a serious situation for a Hamilton woman. Client falls on hard times after a car accident but second mortgage lenders helped her to rebuild financially. Interest only home mortgage gives a Hamilton woman a fresh start after a car accident. Unable to work for over 2 years due to her injuries - victimized all over again by insurers - she was forced to use all available credit to provide for her basic needs. 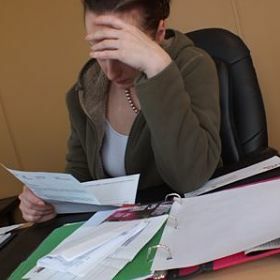 If it looks that your recovery from your accident may be lengthy and you won't be able to earn income for some time, take quick steps to get mortgage help to assess your financial situation before your credit is destroyed. An interest only mortgage from second mortgage lenders can improve your cash flow. The legal process to recover costs from an accident is lengthy and damaging - if you have equity in your home, you can get money fast to tie you over until you are able to work or your case is settled. Getting a second mortgage early on in the process can be a good decision. Benefits are many. A first or second interest only home mortgage can end credit card debt and improve your cash flow, or protect your credit, reduce stress and make it easier for you to get back on track financially. Here you have a sad story with a happy ending -- but, the damage could have been prevented with an early financial assessment and an interest only mortgage. A Hamilton woman suffers a serious car accident which took years to resolve. By the time the client was finally able to return to her $54,000 a year job, her situation looked bleak. Her total debt was now at $74,000 and she could not keep up with her $2,200 minimum monthly payments. These payments did not even make a dent in the debt - barely covering interest and fees. Creditors were calling constantly, threatening and destroying her credit. The damage was done - there was no chance that this lady could repay her debt without intervention. Is a mortgage consumer proposal strategy a useful option? It was clear that client would benefit from a consultation with a Bankruptcy Trustee. $74,000 total debt at $2,200 a month. Trustee confirmed that if we could get the client a consumer proposal mortgage -- he could settle for one lump sum payment at a fraction of the total debt. Fortunately, our client had enough equity in her home to get a Consumer Proposal Mortgage -- a second interest only home mortgage from a private mortgage lender. This interest only 2nd mortgage would cover the settled debt, lender, broker, legal and trustee fees. Client's debt consolidation loan payments reduced from $2,200 a month to a manageable $375. After client received a Discharge she got a secured credit card to re-establish credit. Once her first mortgage comes up for renewal, we'll consolidate both mortgages into a new first home loan. Client is back on track financially! Credit card to rebuild credit. As little as a $500 security deposit will get you started. Here is your best secured credit card to rebuild credit. A secured credit card is necessary to build or re-build your credit whether you’ve had bad credit, consumer proposal or a bankruptcy. Everyone is approved provided you've received your Discharge Certificate. With the secured credit card you'll get all the benefits of a credit card while rebuilding your credit. Get your secured visa application link on the site map table of contents. If you need a mortgage consumer proposal strategy then contact me for a FREE assessment. Together, we'll decide if the interest only home mortgage using private mortgage lenders is for you. Thank you for visiting and come back often. Please help me spread the word about interest only home mortgage. Using the comment box and buttons below, share with your Friends.